When I was expecting my second child, my first child Mia was only one year old. That meant, when my second would be born, the first would be one year and nine months only. Like all moms-to-be excited as I was, I couldn’t put aside altogether, a few stray worries and anxieties about colic bouts, sleepless nights, and the like… all over again! My anxiety was not baseless because my husband Harry is often away on business. Plus, Mia loved to go out to the park every day and watched me brimming with excitement and joy as I fed the ducks! That was one of our regular mom and daughter thing that we both thoroughly enjoyed! One of my serious worries was how I’d manage to take them both out without any help. That is when my best friend, who was already a mother of twins, recommended me to buy a Contours Options Tandem Stroller for easy movement with two small children in tow. So whether it’s going to the nearby departmental store, an evening stroll or a doctor’s visit, I am grateful to this flexible stroller, for making my life easy! I am here to write this review for sharing my experience of parenting flexibility that this product has offered me and other parents with two children in a tow. Multiple parenting is a difficult task. Having to look after twins or a toddler and an infant together is a great everyday challenge that parents face! The most difficult part is moving around with two kids to perform your daily errands or a relaxing evening stroll. That is where a double stroller can prove to be invaluable to you. The Contours Options Tandem Stroller offers a great deal of flexibility and numerous built-in-features needed for safety and ease. Where Can You Read More Reviews Of the Contours Options? The Options tandem offers 6 reversible, inter-changeable or removable seat positioning features for added flexibility and preference. This feature can make it possible for the children to face each other, face the parent, face forward or even sit back to back. It offers seating flexibility that can help children to enjoy each other’s company, avoid each other’s company on ‘bad mood days’, see the mother’s face and derive comfort or explore the new world around them! This versatile feature can help you change your child’s view whenever and wherever you choose. The unique uni-flex design can turn the tandem into a single-seated stroller with extra storage space. For mothers who want to carry one child around and leave the other with the nanny at home for may be an emergency doctor’s visit, this can be a great option available in this stroller. The Options tandem stroller can make it possible to remove a seat and create a huge amount of space for extra storage. The second optional car seat attachment is available separately for twins. Even without removing a seat, the stroller offers enough storage space for your baby stuffs, like diapers, clothes, bottles, etc, underneath the seats. The seat is made of soft micro fleece fabric for a smooth and comfortable feel. The tandem stroller also offers removable head rest for greater child comfort and fully reclining seat and rear stadium-style seating for a clear view of the surroundings. The sun canopy also protects the children from the harsh ultraviolet rays. The Options tandem stroller offers numerous toddler features like easy step-in, holds-on handles and 5 point restraint harness for comfort and protection. As you know that it is important for babies to be comfortable while on the move, and Options tandem stroller can make the journey a pleasurable one for them as well as us parents. For greater comfort of the parent carrying the babies in the tandem stroller, the Options ZT015-LGN1 offers user-friendly options. The handy quick-trigger fold and a free-stand design help the stroller to remain upright after folding. 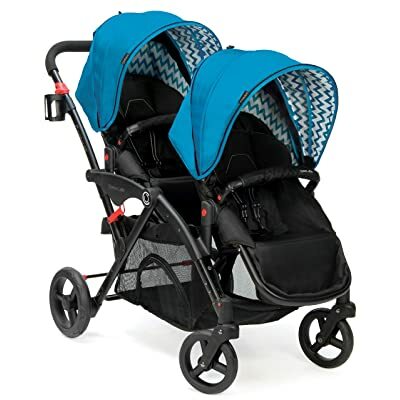 The folded size of the tandem stroller is 24″ x 25″ x 42″. Its 8″ single swivel suspension wheels and 10″ never- flat wheels at the rear offers better maneuverability to the parent through doorways and the like. There is also the parent tray with holders for two cups with lid. Handy quick-trigger fold and a free-stand design help the stroller to remain upright after folding. Folded size is 24″ x 25″ x 42″. What Users Are Saying About This Stroller? 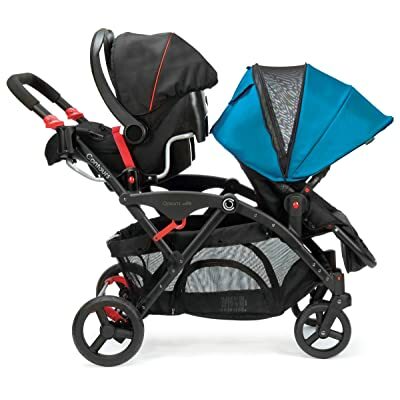 The Contours Options Tandem Stroller has earned rave reviews for its quality and advantages. There are many advantages and disadvantages about the product that users have discussed in details in this site that may help you to decide whether to buy this product or not. 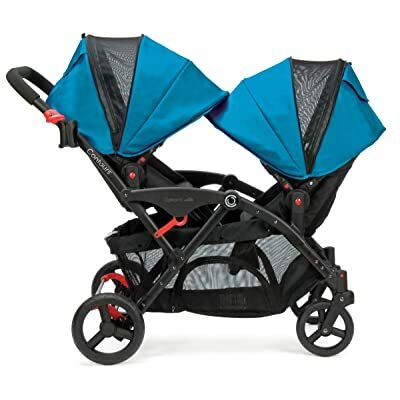 Users have found the Contours Options Tandem Stroller an easy-to-use stroller with comfortable and durable features that can lend a smile to the mother’s face! Handy flexible seats that can be turned in any direction as per preference. Most of them have found this unique feature a great advantage. Some find it extremely beneficial during a sunny day when the seat direction can be changed so that children do not have to face the sun. Plush and comfy seats that can recline for a comfortable nap. The front handle can be easily pulled to recline the seats so that your baby gets a relaxing nap during the ride. All terrain wheels that easily push through any type of terrain. Most of the users have found the easy maneuverability of the stroller a great advantage especially over rugged terrain like hills, gravels, grass, woods, etc. Easy to navigate when loaded, in spite of its big size. Very easy to assemble with simple and clear instructions. Users have taken only 20 minutes to assemble the stroller. The Contours Options Tandem Stroller is not without complaints. Users have pointed out few disadvantages that they have found unsuitable in the product. Some feel that the size is too big. The front canopy takes up lots of space and annoys the back rider. No food-tray. A food tray could have helped a great deal to prepare and serve the child while seated. Stroller can be folded only after removing one seat or when seats are facing each other. Changing diaper in the seat is difficult. You can read more reviews of the Contours Options tandem stroller from first hand buyers and users at Amazon. In spite of few minor disadvantages or complaints, the Contours Options Tandem Stroller can be a great choice for a smooth ride for you and your child. If you are looking for flexibility, durability and comfort of your two little-ones and also yourself while on the move, you can seriously consider the product for your family. As Amazon offers you a great deal on the product, you can buy it from this online site and avail of special offers. I love this stroller! It is lightweight and easy to use and colapse with one hand. The tray is difficult to attach, but is not necessarily needed. It has everything I need, and maneuvers easily. Plenty of space for a purse, cup of coffee, extra snacks, goodies, diapers, etc.